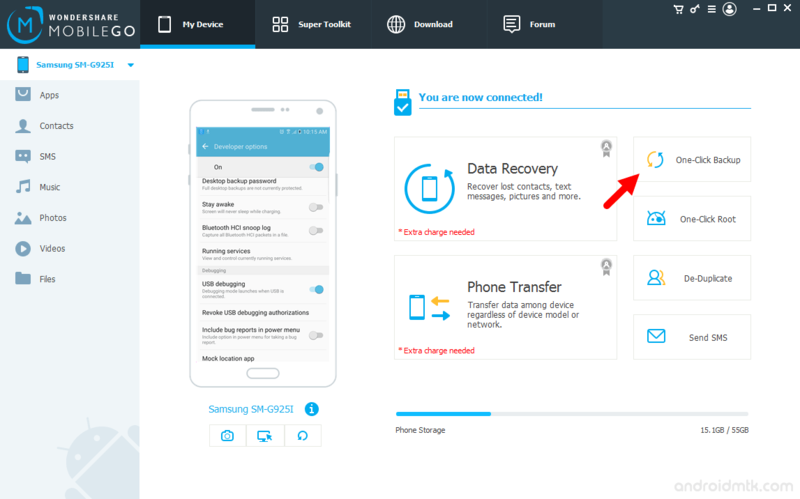 There are many situations in which we wish to take backup of our android device and save the data on the computer instead on the Device itself, in that situation there are only few applications available which suits our needs. One of them is Wondershare MobileGo for Android Application. 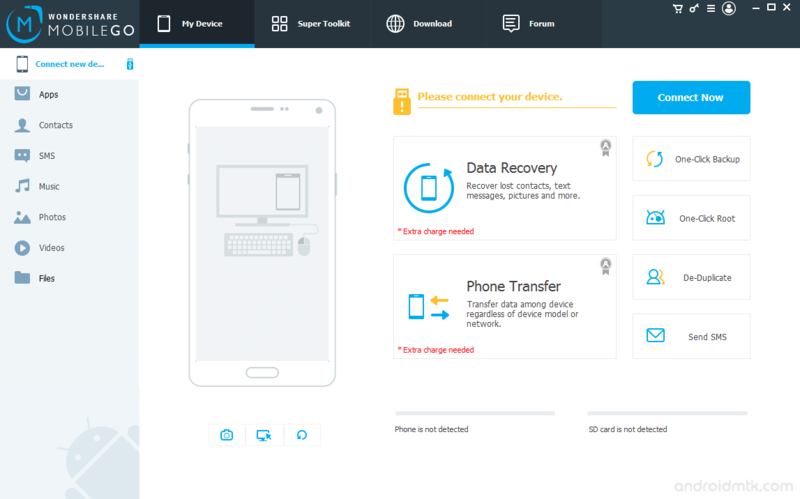 It allows you to backup and restore your Android Device Data in few clicks. Beside this it also allows you to Install Applications from Computer to Phone, Send SMS from computer, Import contacts from Windows Phone, Converting Music and Videos and lots more. 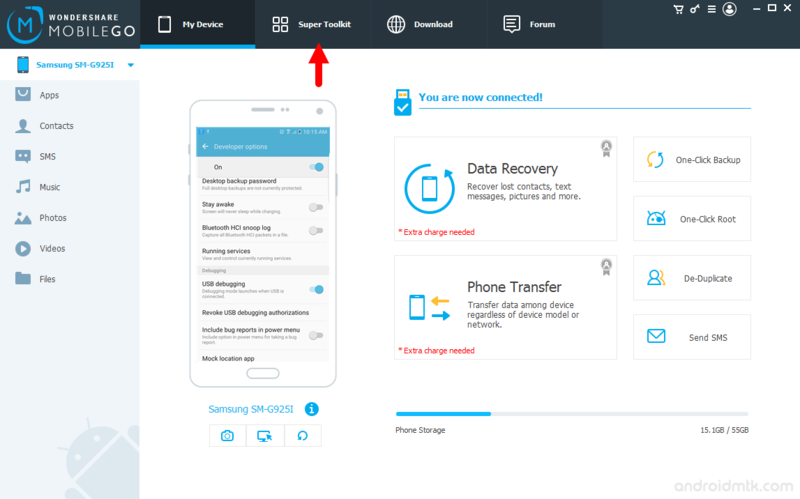 Step 1: Download and install Wondershare MobileGo Application on your computer. Once MobileGo Application is installed Open It. Step 2: Now, Connect your Android Device to the computer using the USB cable (USB Debugging must be enabled). 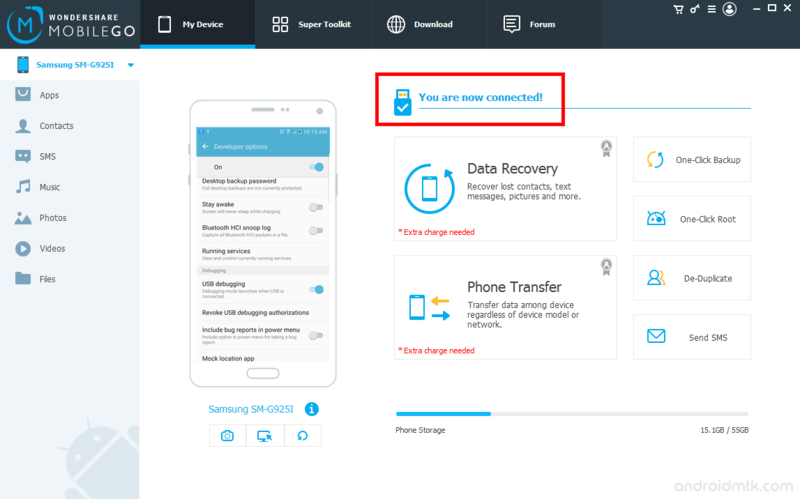 Step 3: Once you have successfully connected your Android Device to the computer, Wondershare MobileGo Application will detect it and show it in the Devices list. 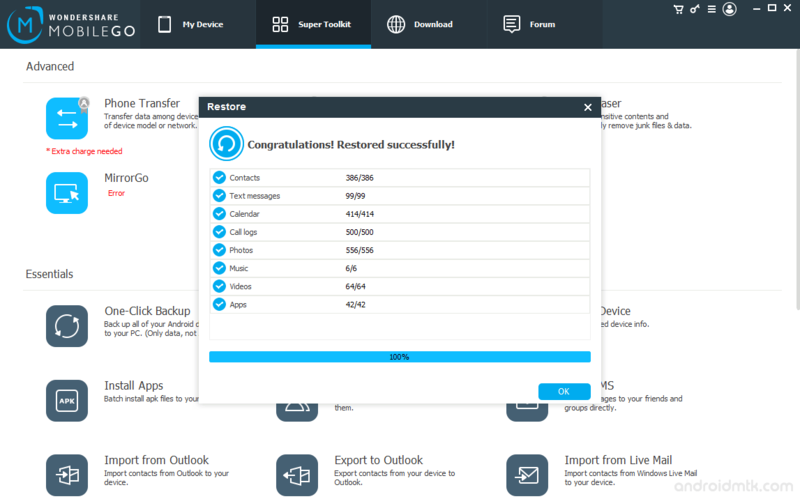 Step 4: Now, Click on the One Click Backup Button. 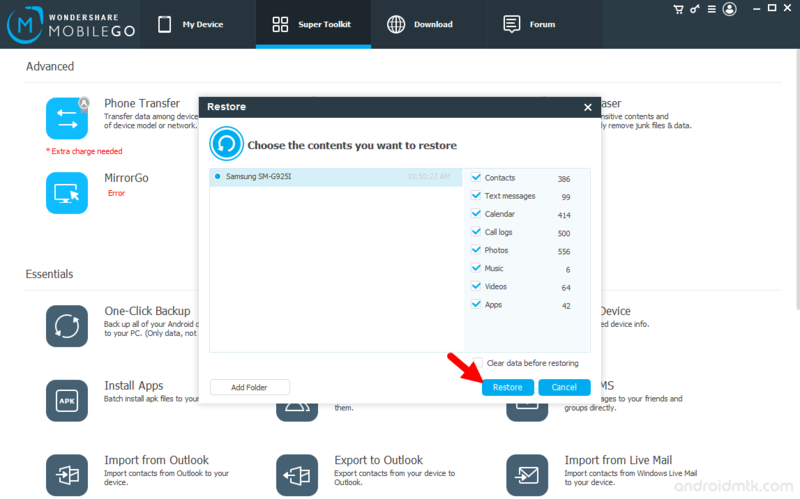 Step 6: Once you have selected the contents that you want to backup, then Click on the Backup Button to Start. 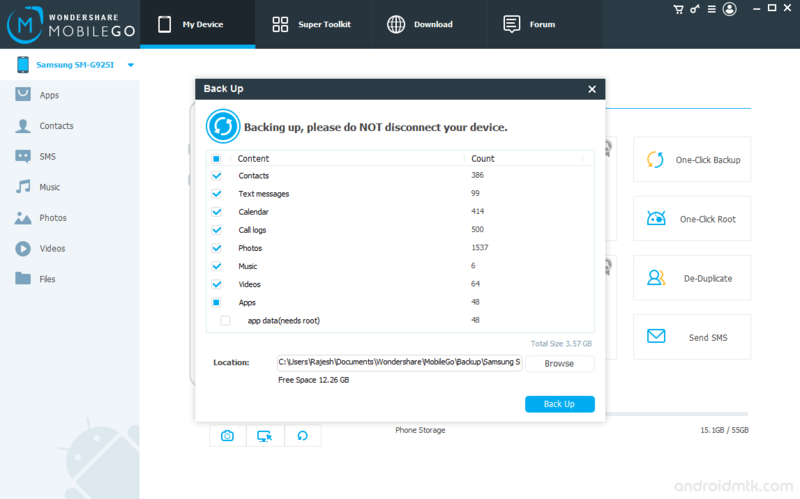 Step 7: Now, Wondershare MobileGo App will take the backup on your device. Once Backup is completed you will be able to see the Completed Message. Step 1: Open Wondershare MobileGo Application on your computer. Step 4: Now, Click on the Super Toolkit Button. Step 5: Now click on Restore Button. 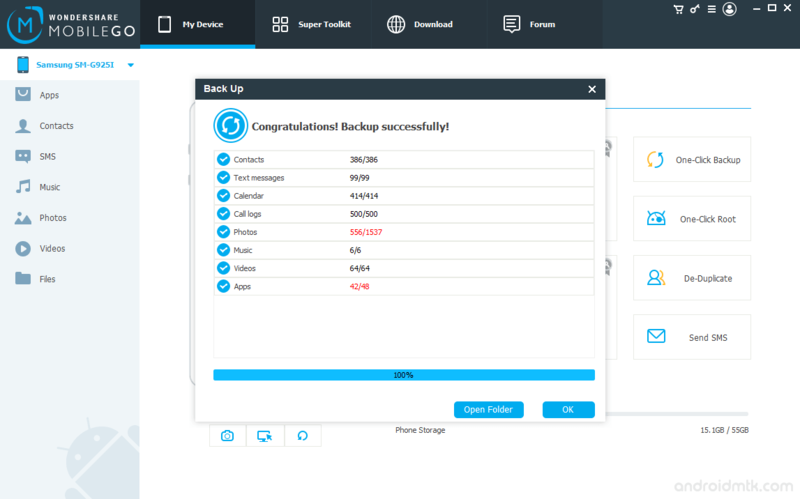 Step 6: Now, Select the Available Backup that you want to restore and Click on Restore Button to Begin the Restoring Process. Step 7: Once Restore is Completed you will be able to see the Restore Completed Message. [*] Rooting Feature: MobileGo for Android also comes with the Root Feature which allows you to Root any Android Device in Few Clicks. 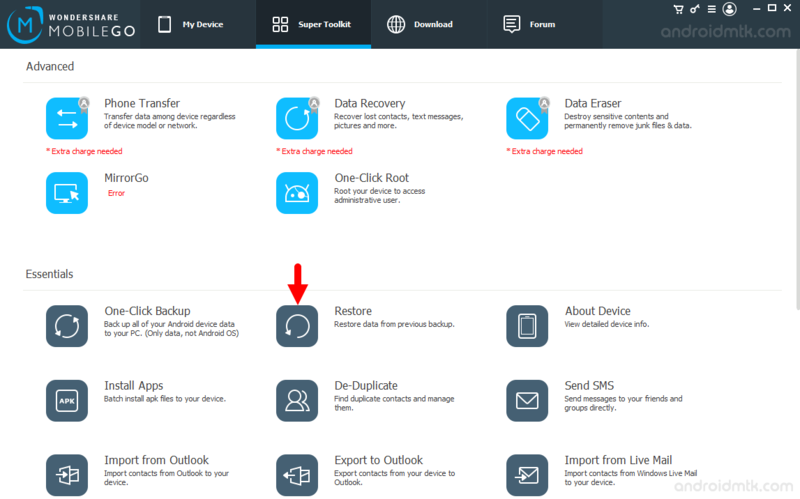 [*] MobileGo for Android: MobileGo is also available on Android Play store, which also allow you to backup and restore everything on the device.